Lucerne Tourism's Friendly Hosts, all volunteers, have been out and about in Lucerne city every summer season since 2012. They assist and advise visitors from all over the world and show them the best places to go. 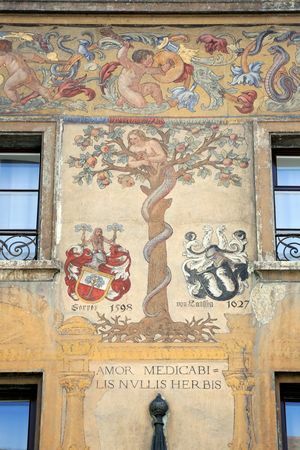 The seventeen lady and nine gentleman hosts, enthusiasts all and devoted to a city they love, contribute their time on a voluntary basis for the benefit of visitors from home and abroad. Between May and October, these Friendly Hosts in their distinctive red jackets may be found in Lucerne's streets and squares, helping to provide visitors from all over the world with a personalised, memorable holiday experience. They are inexhaustible sources of information about local sights, directions on how to get to places, and excursions in the Lucerne – Lake Lucerne Region. This dedicated group consists mainly of 40- to 80-year-old (early) retirees and housewives; their language proficiency extends to ten-plus languages. The Friendly Host scheme came out of an idea originally dreamed up by Heinz Koch, who had been acting as a kind of «tourist information centre on legs» in Lucerne city for over ten years. 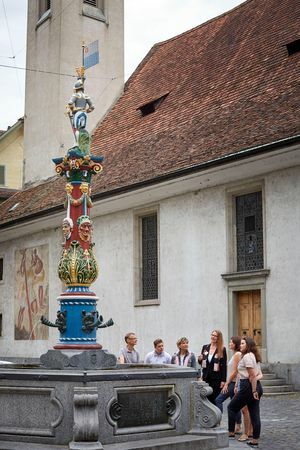 The «Your Friendly Host» project was launched by Lucerne Tourism in 2012 with the support of the "Luzern leuchtet" project group. A newspaper advertisement was used to identify Friendly Hosts who liked the idea of being involved in Lucerne's hospitality endeavours. Meanwhile, Lucerne Tourism's Friendly Hosts are now into their seventh summer season and very much part of Lucerne's cityscape. They have also become a model for other tourist destinations. To coincide with the 2015 Gästival «guest-festival» celebrations marking 200 years of tourism in Central Switzerland, the scheme was extended to include the entire Lucerne – Lake Lucerne region. 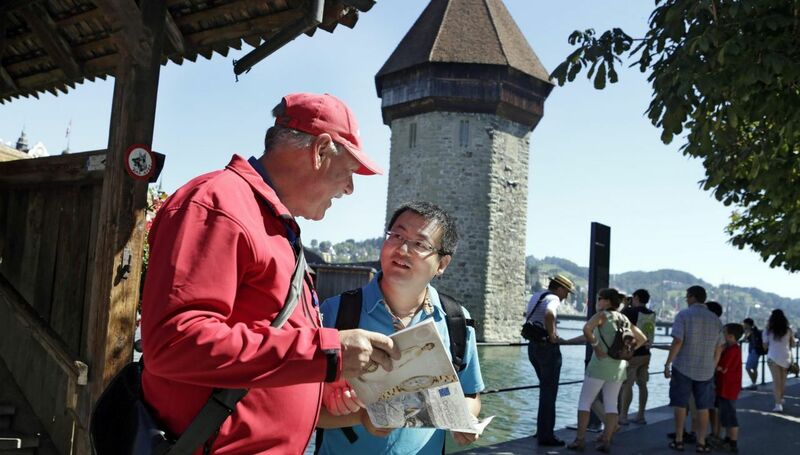 Since the end of May 2015, more than 70 Friendly Hosts have been out and about in the Central Swiss cantons of Lucerne, Obwalden and Schwyz, contributing to the visitor experience with the aim of ensuring tourists in the region enjoy an unforgettable stay. 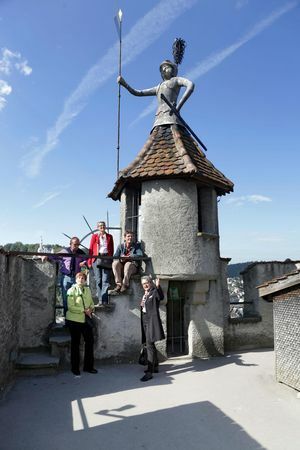 The Friendly Hosts in Central Switzerland are supervised by the local tourism organisations. During the Gästival festival of hospitality in 2015, Lucerne Tourism's Friendly Hosts were awarded the «Friendly VOLUNTEER AWARD 2015» by the Lucerne Tourism Forum and honoured for their exceptional commitment. Would you like to become a Friendly Host? Spring regularly finds us looking for people who are knowledgeable about Lucerne and keen to extol the virtues of their city to visitors. Through your voluntary contribution as a Friendly Host, you will help visitors from all over the world have an even more enjoyable stay and ensure that they retain fond memories of the Lucerne – Lake Lucerne Region. You'll be present in Lucerne's busiest spots between May and October, assisting people from all over the world. You can organise your contribution to suit your particular availability: via a Doodle link, you can sign up for one three-hour or so shift a day for at least three days a month. In exchange, you'll be given the red Friendly Host jacket and useful brochures to hand to visitors. 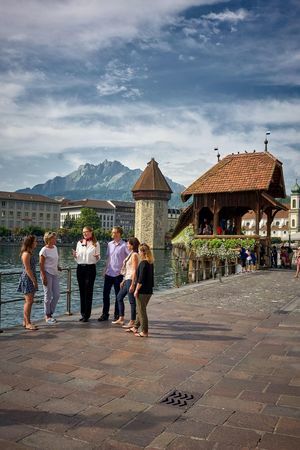 Lucerne Tourism's Friendly Hosts are rewarded with a variety of vouchers, and we hold a number of events throughout the year where you can socialise with your colleagues and improve your knowledge of the Lake Lucerne Region even further. Your heart beats for the Lucerne – Lake Lucerne Region and you know the local area and region well. You are fluent in spoken German and English and (ideally) proficient in other languages. You are communicative, outgoing, flexible and approachable. You have a friendly, well-groomed appearance. You are willing to volunteer for at least three days a month for about three hours at a time. If so, please contact Anna Hartmann: anna.hartmann@luzern.com, Tel. +41 (0)41 227 17 22. I look forward to hearing from you and telling you more about the useful work done by our Friendly Hosts.